Debbie and Jerry McDaniel knew that when they retired, they wanted to build their dream house. After a few years of searching for the perfect homesite, the couple found it and constructed their custom home. 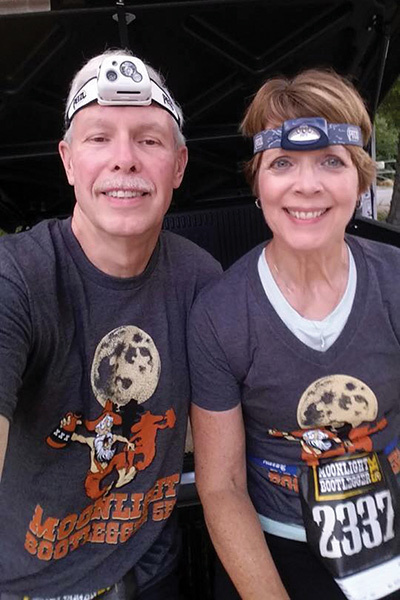 The McDaniels, who have been married for 45 years, have always been active—enjoying cycling, running, and kayaking—and they wanted their new home to be near the trails and lakes they love. “Within three miles or so, there’s probably eight trails and three lakes,” says Debbie. 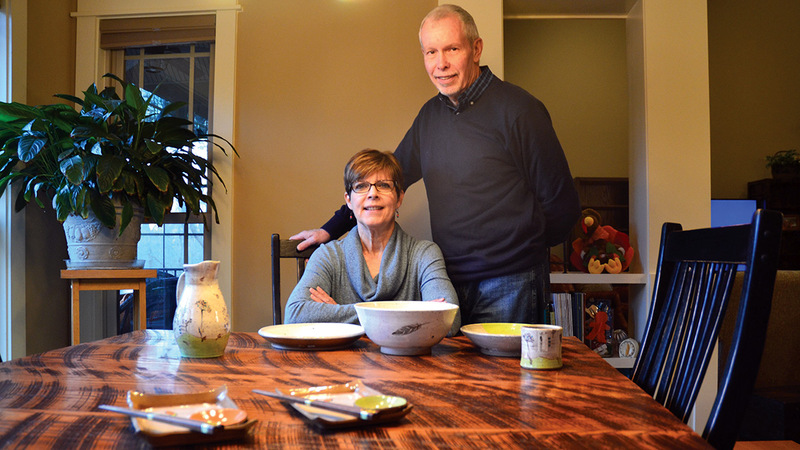 After retiring, Debbie and Jerry McDaniel built a custom home with pottery studio and wood workshop for their hobbies. Debbie and Jerry moved to North Carolina from Florida in 1980. 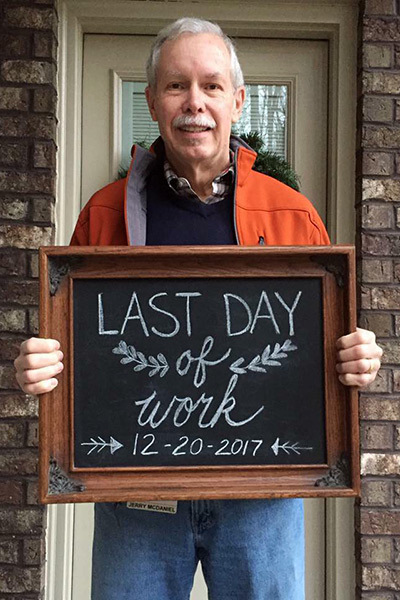 Jerry, who has a background in electrical engineering, worked as an engineering manager for 38 years, retiring in December 2017. Jerry says he put off retiring for a number of years because he was afraid he’d miss the work. Jerry meets his former coworkers for lunch twice a week and he always finds time to stay active. Thirty years ago, he says, he made a commitment to exercise and has stuck to it. “A large part of that has either been a combination of biking—on the road, a little bit of mountain biking—and trail running,” he says, adding that he usually runs Mondays, Wednesdays, and Saturdays during the summer and Wednesdays and Saturdays during the winter. There was one month—July 2018—when quadricep tendonitis in one knee kept him from walking or running for two weeks. “I only did about 60 miles that month,” he says. After Jerry retired in 2017, they built their dream home in North Carolina. 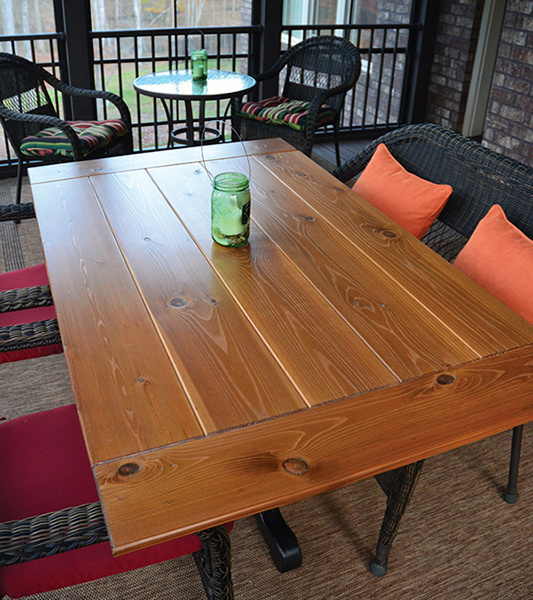 Jerry made this tabletop, which they use on the screened porch of their new home. Debbie returned to college as an adult to get a degree in graphics, and worked in the advertising and graphics industry for 25 years. She retired in 2015 from Pace Communications, where she was a production director handling the printing for Verizon, one of the company’s clients. When she turned 50, Debbie saw an advertisement for pottery classes. She’d always had an interest in clay, having bought a kick wheel and kiln when she and Jerry lived in Florida. 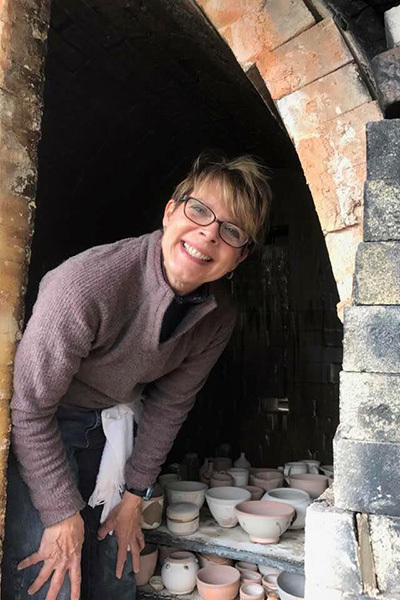 When designing her pottery studio in their new home, Debbie says she knew what she wanted—mostly from what she didn’t have in her basement studio at their previous home. There, she had to carry water downstairs, use space heaters in cold weather, and had only one window. In her new studio, she has a large sink with a clay trap, bright lighting, large windows, and a kiln room. 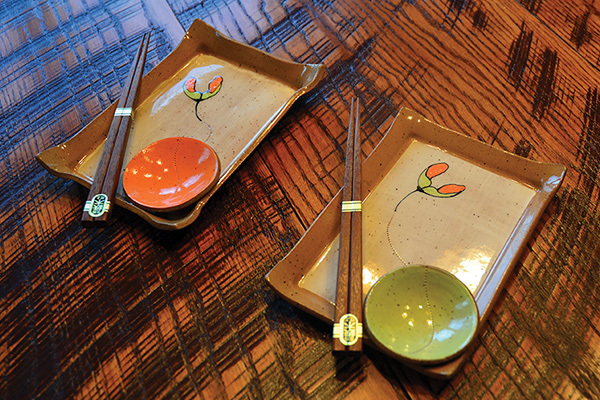 “I never was able to hook my kiln up [at the other house],” she says. Jerry’s skill with woodworking has come in handy for Debbie, as he’s built a ware cart, wedging table, glazing table, and “bat mobile” to hold her pottery bats. “She does functional pottery, I guess I do functional woodworking,” he says. Aside from the functional pieces he’s built for Debbie and for his own workshop—tables for his woodworking equipment and cabinets for his supplies—Jerry has also built a headboard for Debbie’s mother, a captain’s bed, complete with drawers and bookcase, for his grandson; and a drop-leaf kitchen table for one son and a medicine cabinet for the other. Debbie started taking pottery classes when she turned 50. She bought a kick wheel & kiln, and designed a pottery studio. 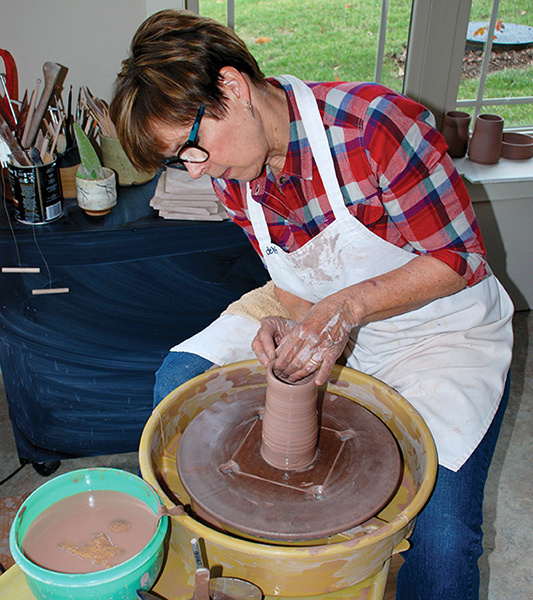 Attending workshops and constantly learning new techniques, Debbie enjoys experimenting with her pottery. “I try to incorporate into my work things that I loved about my graphic arts background,” she says. Using a screen print she made in 1987 from a photograph she took in 1971 of a lake with a reflection of trees, she was able to transfer the image to clay. “And then I did [the pieces] in a wood fire, and they turned out to be exceptional and people just loved them,” she said. Without a doubt, wood fire is Debbie’s favorite firing method. “You can get a beautiful look that you can’t get with anything else,” she says. A labor-intensive process, wood firing takes 18-24 hours, stoking the fire about every five minutes. The kiln takes three to four days to cool down. “And then it’s like Christmas morning,” says Debbie, “taking the door down and seeing all the pots in there. 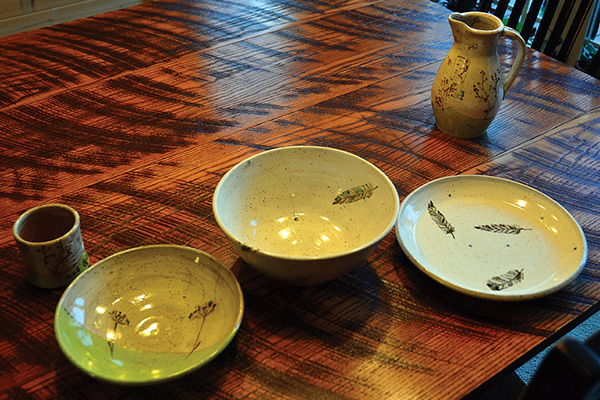 Debbie displays a sampling of her latest pottery: Sushi Trays, bowls, pitcher, and cups. Jerry and Debbie enjoy many activities, including cycling. Adding to their list of retirement activities, Debbie and Jerry recently took up golf. “It’s something I always wanted to pursue. I had an uncle who was an avid golfer and he told me as a kid not to pick up golf until you can do it with lessons because you don’t want to pick up any bad habits,” says Debbie. “So we went for golf lessons before we even got clubs.” They played weekly until August, when Debbie began making pots for the fall shows she attends. This year, she displayed and sold her pottery at five shows: Art in the Arboretum, a juried show where she won first place this year; the Persimmon Festival, which she has attended since its inception 11 years ago; Keep It Local Art and Pottery Show, held at the home of artist Leanne Pizio; and Potters of the Piedmont, held in the spring and fall. The couple would also like to do more traveling. They visited Italy just before Jerry retired, and would like to visit Alaska, exploring the coast and going inland, and Ireland, where Debbie’s ancestry lies.